Hood Boss takes pride in the fact that we don’t only clean your system, we help provide you with products to address your maintenance needs between cleanings. We can also help correct deficiencies that may need to be addressed to keep you in accordance with NFPA 96. As part of your Grease Management Program we offer, for purchase, to our customers the same degreaser and stainless steel polish that we use at the time of service. We do this to ensure that you have the best products to maintain the baffle filters and hood canopy cleanings between services. Please contact us for pricing. Stated in NFPA 96 Code 8.1.1.1 – Approved up-blast fans with motors surrounded by the airstream shall be hinged, supplied with flexible weatherproof electrical cable and service hold-open retainers, and listed for this use. During the exhaust cleaning service your Up-Blast fan has to be tilted back in order to access the vertical duct of the system. If the exhaust fan is not equipped with a hinge kit, the fan has to be lifted off the duct curbing and laid to the side on the roof top. The fan is made of a pliable spun aluminum that is easily damaged. Over time continued service can cause damage to the fan, causing it to be replaced. 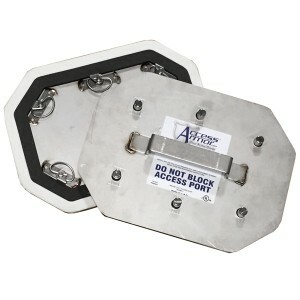 At Hood Boss we highly recommend that code is followed and a hinge kit is installed to protect your equipment. There are different types of hinge kits that can be installed at different prices to fit any budget. By combining our patented Super Hinge technology with a new Jason Wellman inspired pivot system, Omni has created a hinge that is not only fully NFPA96 compliant with hinging and service hold-open retention codes, but also resolves on the roof wastewater issues. 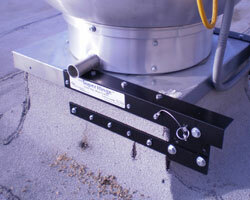 When coupled with our patented Grease Gutter or Roof Guardian grease containment systems or added to an existing Grease Gutter, Grease Box or other system, the QF Easy Clean will resolve most any rooftop wastewater issues. 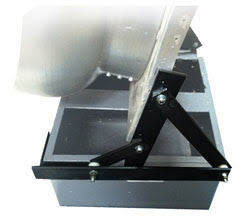 Hinge will resolve most any rooftop wastewater issues. Stated in NFPA 96 Code 7.4.1.1 – On Horizontal ducts, at least one 20 inches by 20 inches opening shall be provided for personnel entry. 7.4.1.2 – Where an opening of this size is not possible, openings large enough to permit thorough cleaning shall be provided at 12 ft intervals. Many restaurant owners are unaware of the dangers that lie above the ceiling tiles in their kitchens. Restaurants with horizontal ducts must have adequate access to remove the grease accumulation that occurs from the cooking process. Hood Boss technicians are trained to install access panels and clean these areas to remove the accumulation as part of your Grease Management Program. If these areas do exist Hood Boss will draw a system diagram outlining where the access panels are needed and the cost associated with the service. Stated in NFPA 96 Code 6.1.2 – Listed grease filters shall be tested in accordance with UL 1046. Hood Boss has relationships in place that can help save you money on the replacement of Baffle Filters. We have the ability to purchase baffle filters of any type and size that you may need. Also, we can educate you on the different types of filters and how they may help the efficiency of your exhaust system. Please contact us for pricing!